Objective: The aim of this study was to determine the presence and severity of inferior alveolar nerve (IAN) affection during bilateral sagittal split osteotomy (BSSO) in two groups of patients with and without direct exposure and visualization of the nerve during surgical procedure. Patients and Methods: In this prospective randomized clinical study, 14 patients (28 sides) indicated for BSSO were included. The sides were randomly divided into two groups with equal number of sides (14 sides). Group I with wide soft tissue dissection of the medial side of the ramus and exposure of IAN above the ligula and group II with minimal soft tissue dissection of the medial side of the ramus without exposure of IAN. For evaluation of neurosensory function of IAN, two methods were used including subjective evaluation and two-point discrimination test. Results: According to the subjective evaluation, there was a statistically significant difference between both groups in favor of group II in all follow-up recalls except in the final one at 12 months postoperatively. Considering the results of two-point discrimination test, the improvement obviously continued during the successive follow-up periods in both groups, with a statistically significant difference in favor of group II until the ninth month, and then in the last follow-up at the 12th month, the records were almost equal. 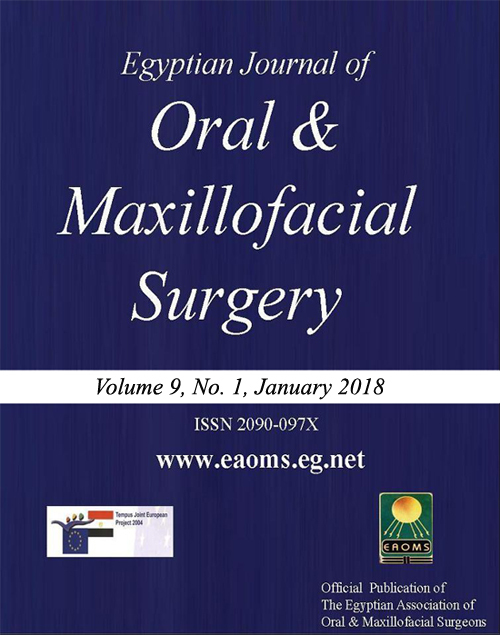 Conclusion: To markedly reduce the postoperative neurosensory disturbances of IAV and to accelerate the full recovery of sensation of the lower lip and chin regions following BSSO, limited exposure and dissection of the medial soft tissues of the ramus should be practiced with avoidance of direct exposure and manipulation of IAN.